The Cosmos Club Historic Preservation Foundation, as a charitable and educational organization, is dedicated to stewardship of the Cosmos Club’s historic building, the Townsend House, and to promoting preservation in the surrounding Dupont Circle and Massachusetts Avenue neighborhood. The Townsend House, the home of the Cosmos Club since 1952, was built for coal and railroad heiress Mary Scott Townsend in 1900. The mansion, a masterpiece of one of the nation’s most noted turn-of-the-twentieth-century architectural firms, Carrère and Hastings, enriches the city of Washington both as a reminder of its history and as a work of art. Inspired by classical French styles, it reflects the Ecole des Beaux Arts training of its architects. In recognition of the importance of this building to the ambiance of the Massachusetts Avenue and Dupont Circle Historic Districts, the Foundation was established in 1985 as a tax-exempt organization to provide funds for the preservation of the Townsend House and related historical materials and for research and educational programs relating to the Townsend House and the neighboring historic area. In carrying out its preservation responsibilities, the Foundation works closely with the National Trust for Historic Preservation. Under an agreement between the two organizations, the Trust reviews all proposed Foundation projects affecting the mansion and its grounds to verify that they are consistent with the Secretary of the Interior's Standards for the Treatment of Historic Properties. The Foundation has funded major structural repairs and restoration of exterior features of the Townsend House, including the roof, façade, windows, gutters and marquise along with improvements of the electrical and plumbing systems and installation of fire suppression sprinklers. It restored the original wrought and cast iron fence which bounds the property. Most recently, the Foundation funded the replication of the deteriorated original stamped concrete driveway with a slight modification to make the entrance wheelchair accessible. The historic Townsend House interiors, still largely intact, were designed by the Parisian firm Jules Allard & Sons, famed for its high style French interiors, working in collaboration with Carrère and Hastings. 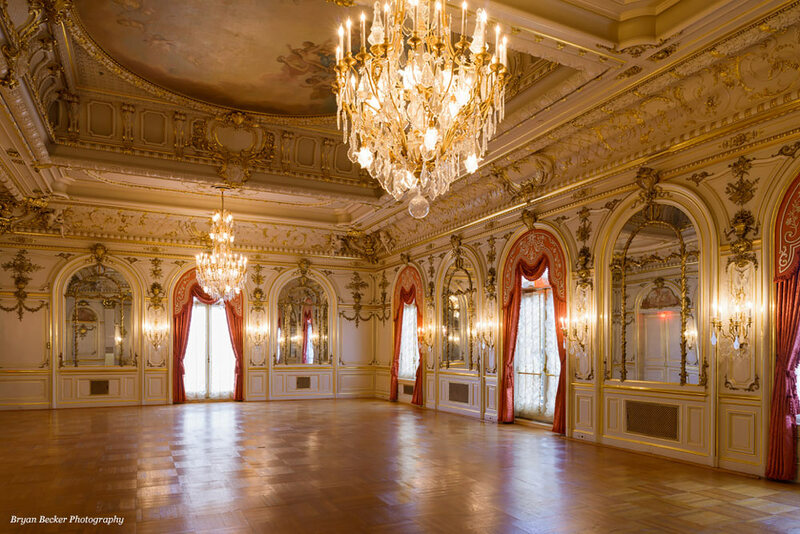 The Foundation guided and largely funded the meticulous, award-winning restoration of the Townsend House ballroom. It has also funded restoration of the entrance lobby and replicated in kind the deteriorated original flooring of the adjacent reception room and the dining room. The Foundation works with preservation and community organizations in the Dupont Circle area and has contributed to the restoration of the Q Street Bridge buffalo sculptures, the enhancement of historic call boxes and the installation of historic markers. The Foundation funded the high resolution scanning of the Library of Congress’s collection of forty circa 1910 historic photographs of the original Townsend house so that they would be available to the public online through the Library’s website.